I thought I would share an update on my medical appointments as I have been back to see my Allergy Consultant. We chatted through the outcome of my visit to the Dermatologist and then discussed a rather unfortunate incident I experienced with M&S chocolates at Christmas. I took a risk on a product labelled along the lines of "not suitable for milk allergy because of manufacturing methods". I am in no hurry to repeat that any time soon. I was given another skin prick test for milk and egg. The results were a mild reaction to milk but nothing for egg. For point of reference there are two categories of allergy - Immunoglobulin E (IgE) mediated and non-IgE-mediated. IgE mediated is the one associated with anaphylaxis and a skin prick test is likely to be positive whereas with non-IgE anaphylaxis is not a response but symptoms may include vomiting, upset stomach and diarrhoea. 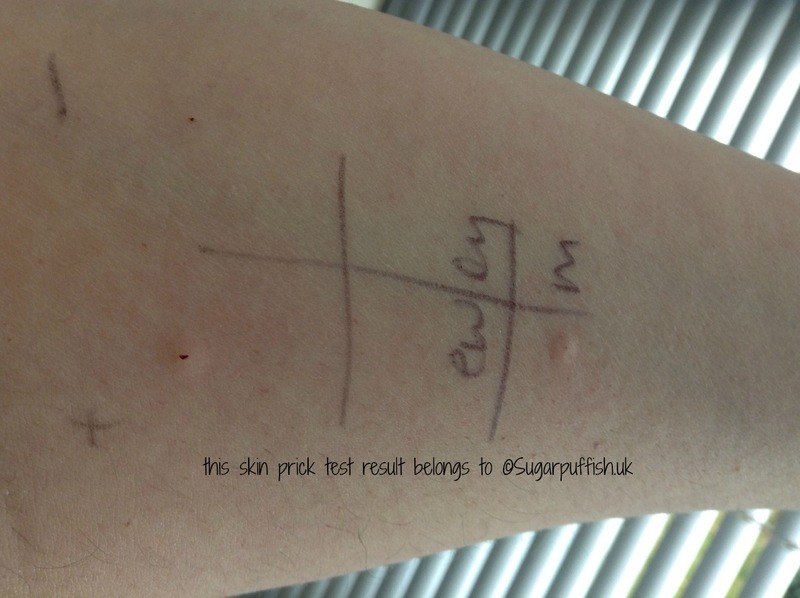 Skin prick or blood tests are negative. Where do we go from here? Well I've been asked to food challenge at home for milk and go to the hospital for an egg challenge. I walked away from my appointment with a mix of emotions as food challenges kind of terrify me. I know my own body and even if a skin prick test is negative I cannot ignore my symptoms. I may never have had anaphylaxis but there is no denying my stomachs and skin reactions. I guess you might say I have developed anxiety towards some foods. I can smell an orange a mile off and the thought of being near one brings me out in a cold sweat because I have a childhood memory of drinking juice and gasping for air. There is another hurdle to overcome I have spent 28 years on a free from diet and in that time I stopped eating meat and became aware of animal cruelty issues. After much contemplation I realised I have no real desire to incorporate animal milks and eggs back into my diet. I have strong opinions about techniques involved in modern farming. The problem with a food challenge is by "passing" the initial test (not having a reaction) you are expected to keep that ingredient in your diet. I believe the theory is that if you stop eating it you may develop a reaction again over time. I have decided not to food challenge for the time being. The truth is I am perfectly happy living life with a diet that leans towards Vegan. It is not an easy diet to manage outside of the home as I can feel a little alienated by restaurants but things are slowly improving. My experience with chocolates at Christmas, my skin prick test and my viewpoints on animal cruelty put me off entertaining the thought of challenges. For the time being I am finished with hospital appointments. It has been a worthwhile experience pursuing a long overdue follow up. I think from this point the rest is up to me, there is little more that the Doctors can do. The test results for milk have been interesting given the consultant was initially dismissive that I still have a problem because there is an expectation that children grow out of some allergies (it does happen). I am happy that my free from lifestyle is still the correct way to manage sensitivities. I am still challenging my OAS and I am now enjoying a few more fruits but I am still a long way off eating an orange. In my other appointments I was diagnosed with OAS and Methylisothiazolinone allergy, to read about them simply follow the links.